For Windows 8 and later apply the fullscreen border fix. 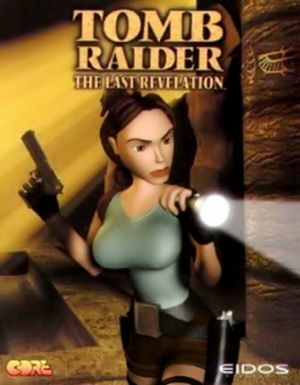 Windows version ships with the Tomb Raider Level Editor (TRLE), which allows users to make their own adventures. Lacks the dynamic shadows of the Dreamcast version. 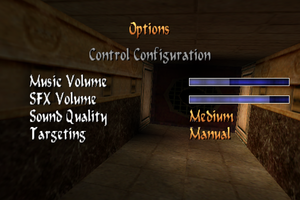 The Multipatch disables the CD check in addition to fixing compatibility issues. Also includes Tomb Raider Chronicles. The GOG.com version is a complete edition. The Times - Exclusive Tomb Raider Level is part of the bonus content downloads. The level was later released as freeware for those whom own the base game, so Steam users aren't completely out of luck. Patch Fix solves the disappearing Uzi and not being damaged by you own grenades bugs. level patches corrects issues with Giza levels. Times Patch fixes broken audio and animations in the exclusive Times level. Tomb Raider Mouse Helper is a utility which allows controlling Lara with the mouse. It also maps the WASD keys to enable a more modern, keyboard+mouse control scheme. OpenTomb is an open source remake of the Tomb Raider engine. It overhauls almost all aspects of the game engine, along with adding cross-platform support for modern operating systems and Lua scripting support. Stretched by default. Use Peixoto's patch. Stretched title screens and loading screens are available here. Use Tomb Raider 2,3,4 Widescreen Patch. Tick the "Windowed" box in the setup, it makes the game run in a borderless window. Use Helix Mod: Tomb Raider 2-3-4-5 to disable. If you have the retail version, make sure you are running the latest patch. Use Peixoto's patch to add support for XInput controllers. P is hard-coded as the "Pause" button, which is necessary to quit the game. Cannot bind "Pause" to a joystick within the game. See Helix Mod: Tomb Raider Chronicles [Tweak Guide] or Helix Mod: Tomb Raider 2-3-4-5. Download the Bink Video 1.0a DLL. Extract binkw32.dll into the installation folder. 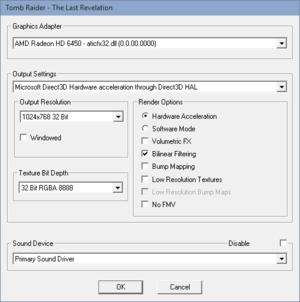 Download and install the Tomb Raider series fullscreen border fix. For game mods visit Core Design. 3D accelerator card strongly recommended. ↑ 2.0 2.1 File/folder structure within this directory reflects the path(s) listed for Windows and/or Steam game data (use Wine regedit to access Windows registry paths). Games with Steam Cloud support may store data in ~/.steam/steam/userdata/<user-id>/224980/ in addition to or instead of this directory. The app ID (224980) may differ in some cases. Treat backslashes as forward slashes. See the glossary page for details.